Below you can view all the homes for sale in the The Willows subdivision located in Zionsville Indiana. 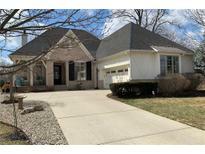 Listings in The Willows are updated daily from data we receive from the Indianapolis multiple listing service. To learn more about any of these homes or to receive custom notifications when a new property is listed for sale in The Willows, give us a call at 317-987-2530. Short drive to the quaint 'Village' of Zionsville with it's brick street shops & restaurants. MLS#21626321. Encore Sotheby's International. Stone wrap sets this cottage like home apart-3 car garage, open, high end finishes throughout. MLS#21608086. Encore Sotheby's International. Impressive office w/ custom floor-to-ceiling bookshelves & French glass doors. MLS#21611953. Keller Williams Indpls Metro N.
This is a striking home in need of cosmetic improvements, but one STEAL of a DEAL! MLS#21586462. Carpenter, REALTORS®. Enjoy the Community Amenities, complete with tennis, basketball, playground and picnic shelter. Community also has 2 pools! MLS#21585844. F.C. Tucker Company. Covered Lanai, 3c garage, Lower Level w/Recreation room, home theater area and full bath rough-in. MLS#21575353. ERA Real Estate Links.